Slough House is a dumping ground for British intelligence agents who’ve screwed up a case in any number of ways—by leaving a secret file on a train or blowing a surveillance. River Cartwright, one such “slow horse,” is bitter about his failure and about his tedious assignment transcribing cell phone conversations. 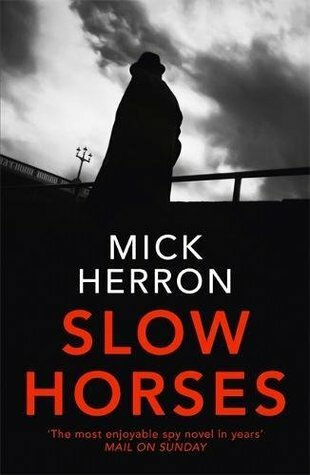 I’d heard a lot of good things about Mick Herron’s Slow Horses, so when I saw him on one of the panels at Hull Noir last year, I took the opportunity to pick up a copy and get him to sign it for me. Slow Horses opens with a scene at King’s Cross station, where we follow River Cartwright in pursuit of a suspect. It’s an incredible opening, with a deft hand for detail and tension. What follows is the story of the ‘slow horses’, sidelined to the nondescript Slough House, each a failure of sorts, put out to pasture where they can cause the least harm. Slough House is filled with some brilliant characters, not least their leader and chief misfit, the unforgettable Jackson Lamb. I’ve read a fair few thrillers and have never come across his like. Grumpy, sarcastic and almost entirely unpleasant, Lamb is a fabulous character who’ll grow on you over the course of the book, whilst still maintaining his gruff, unkempt and almost entirely unpleasant exterior. But there’s more going on beneath – Lamb is a smart, savvy character who will quite happily eat you for breakfast before breaking wind and sloping off for an actual breakfast. The story is also first-rate – a young man is kidnapped and his captors are threatening to broadcast his beheading live on the internet. ‘Five’ at Regents Park are on the case, but will Lamb and his slow horses pip them at the post? Gritty, dark and shot through with a beautifully dark wit, Slow Horses is one not to be missed. Utterly brilliant, and I’ll be racing through the rest of Mick Herron’s back catalogue to get ready for book five, London Rules which is out now.